The Millipak™4Q controller operates in full 4-quadrant mode allowing contactor-free operation in direction changing and regenerative braking. 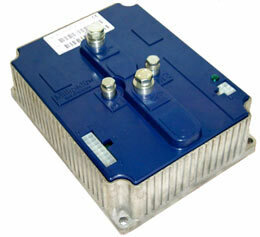 It operates in either torque or closed loop speed control mode. The Millipak™4Q permits adjustable regenerative braking without the use of additional electronic circuitry and contactors. The Millipak™ product line is an ultra compact series of controllers providing an unrivalled power to dimension ratio which optimizes the power/size/cost relationship. Sealed-for-life design combined with rigorous testing ensures that Millipak™ controllers deliver unparalleled reliability. 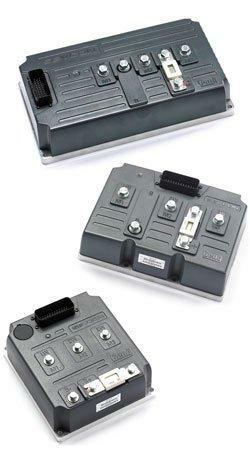 This controller is designed to control both AC Induction and Permanent Magnet AC Motors. The Gen4-series represent the absolute latest design concept for compact and reliable AC Controllers. They feature the smallest footprint in the industry for their power capability. The high efficiency of these controller makes it possible to integrate them into very tight spaces without sacrificing performance. The design has been optimized for the lowest possible cost while maintaining superior reliability in the most demanding applications. The Sevcon DC/DC Converters are suitable for all electric powered vehicles and are designed to be fitted on-board the vehicle and connected permanently to the battery. These converters deliver a stable isolated high power, low voltage DC supply for such accessories as lights, horns, and wipers. This eliminates inefficient battery taps and fragile, expensive high voltage accessories. 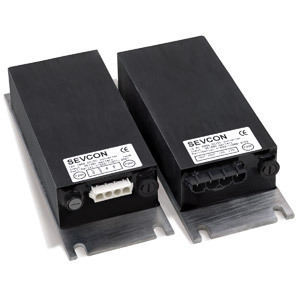 Custom designed for use with motor controllers, these compact, yet powerful converters can be connected in parallel for higher power requirements to perform reliably in industrial and commercial environments. Safer than direct battery connection, these converters provide an electrically isolated output for ancillary equipment. Output is regulated to 13 or 26 VDC, depending on the model, and is maintained regardless of input voltage variations throughout the operating range. Encapsulated to achieve a protection rating to IP67, these converters can be used with complete confidence in the most punishing environments.